Whale scientists said, "The animals inadvertently consume plastic and plastic waste, which causes them to suffer and starve with full stomachs." (link) They blame the stranding on the garbage floating on the oceans. Think about it! How can a pod of majestic sperm whales using the most advanced biosonar system in the world to locate the squid they eat in the total darkness 5,000 meters below the surface might "inadvertently" identify plastic and ropes and other garbage as food? The truth is that these sperm whales had been suffering biosonar failure ever since they were injured by rapid and excessive pressure changes above the epicenter of an undersea earthquake (aka. seaquake). The injury is barotraumatic in nature and mainly affects the enclosed cranial air spaces. Seaquakes are sudden disturbances in hydrostatic pressure caused by an underwater volcanic explosion or earthquake. Seaquakes are not tsunami waves. Seismic vibrations induced into the water by such natural undersea upheavals travel through the hydrospace as a series of rapid and often excessive changes in ambient water pressure called t-phase waves by scientists. Seaquake waves (t-phases) are longitudinal waves also known as sound waves, pressure waves, seismic P waves, and compressional waves. These waves travel as a series of low frequency (LF) alternating compressions and rarefactions that can easily exceed 600 p.s.i. positive pressure following a split second later by a 1,200 p.s.i. drop to a minus 600 p.s.i. negative pressure. Seaquakes can last for up to a minute. Such LF alteration in ambient pressure is every diving mammal's worse nightmare come true. Nothing could be more dangerous to a pod of diving sperm whales than to be surprised by a moderate undersea earthquake, volcanic explosion, or the violent impact of a heavenly body with the ocean's surface. Pressure waves generated by military sonar, undersea explosions, and oil industry airguns also cause a similar danger. But this energy MUST catch diving mammals by surprise. If they hear it coming, they will run away. The dangerous changes in pressure MUST catch the whales off guard. Under ideal condition, excessive changes in the surrounding water pressure can easily rupture the sinuses of all the diving whales within ~25 km of the epicenter of a violent ocean upheaval. 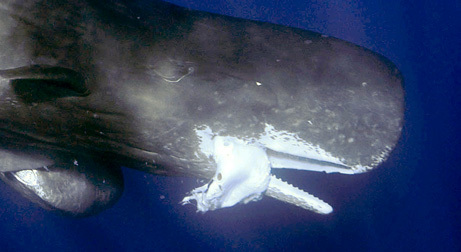 Because the air in a whale's sinuses serves underwater to reflect, focus, and channel returning biosonar clicks, pressure-induced sinus injury can easily destroy their ability to use sound to navigate along with their ability to dive and to tell the acoustic difference between plastic garbage and squid. Since diving is extremely painful if their biosonar system is not working, starving whales will eat anything that might appear to be food, such as plastic, rope and other flotsam. Furthermore, because their fresh water comes from the food they eat, they will likely strand 2-4 weeks later extremely dehydrated with only garbage, non-digestible squid beaks, and bile in their stomachs. 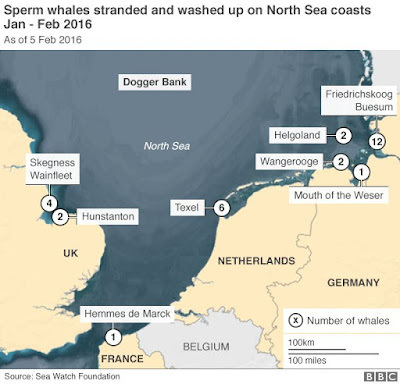 It should be obvious to those who have followed this story that all the sperm whales in this bachelor pod had lost their acoustic sense of direction long before they entered the North Sea. As you will read below, this stranding was a result of a magnitude 5 seaquake along the Mid-Ocean Ridge in the North Atlantic Ocean at 45.11 N ; 28.09 W. The interesting point here is that in January 1996 a pod of bachelor sperm whales beached in the North Sea near Aberdeen (link) following a seaquake of the exact same magnitude very near the epicenter of the earthquake that caused the current beaching (link). The same thing happened on 3 November 1994 when a bachelor pod stranded in the southern portion of the North Sea between the islands of Terschelling and Ameland, in the Netherlands (link). This stranding was preceded by a series of 3 earthquakes in the Norwegian Sea north of Iceland. These 3 quakes occurred one after the other and ranged from 4 to 4.6 magnitude (link). The USGS reported the larger quake as 4.7 magnitude. The similarities between all 3 beachings are eerie. The stomachs of all the bachelor pods were void of any fresh food. On the other hand, the non-digestible squid beaks in the stomachs of the sperm whales stranded on 3 November 1994 indicated that this pod had been feeding on squid from the Norwegian Sea north of Iceland in the same area of the 3 earthquakes. Sperm whales navigate by sending out clicks and reading the echoes. Their biosonar system uses the air inside their elaborate cranial sinuses as acoustic mirrors to reflect the sound waves in a fashion to make their sonar work. This means that if they encounter a sudden series of rapid and excessive pressure changes during a feeding dive, they might suffer a barotraumatic injury in one or many of the sinus membranes that would defeat their biosonar system. You would be terribly wrong to think a potent seaquake could not injury an entire pod of diving whales if they were caught by surprise during a feeding dive. The same event would be somewhat harmless if the pod was on the surface where they could quickly raise their heads out of the water and protect their cranial air spaces. In 1972, NASA physicists told us that a magnitude 7.4 seaquake could generate a shock wave of ~100,000 pounds per square inch (link). But this was before the Marine Mammal Protection Act of 1972 was signed into law. After this legislation took effect, the US Navy suddenly decided that they had rather you believe seaquakes were harmless. They joined forces with the oil industry and together, the two worst marine acoustic polluters in the world started financing 97% of all whale research worldwide. They used public funds to bribe the world's whale scientists into coming up with the results they wanted and ignoring the truth. They learned this trick from the tobacco industry who bought out the medical researchers working on the dangers of smoking. This is no joke, nor is it a grand conspiracy theory. Read about this shameful cover-up and make up your own mind (link). Regardless of all the lies floating around from dishonest whale scientists, the cause of this mass beachings for millions of years has been sinus barotrauma induced by natural undersea upheavals. Healthy sperm whales eat giant squid. They hunt these animals in total darkness with sound just like bats find their food. Whale scientists agree that the stranded sperm whales had lost their sense of direction. But they say it was because the whales followed giant squid into the North Sea where the water was too shallow for echoes to bounce back properly. This is a poppycock lie for several reasons: First, Architeuthis, the giant squid sperm whales love to eat, feed mostly on deep water fishes and other squids not found in the North Sea. And don't think sperm whales are stupid. If they were healthy and were not already suffering navigation failure, they would turn and swim away from any point in which the biosonar system stopped working. It would be like a bright light suddenly blinded you while walking south. You would stop walking if you had no idea what was in front of you, and so would healthy whales. You would turn around and go back north where you could see as would the whales. For scientists to tell you that the sperm whales keep on swimming blindly around in the North Sea because their biosonar didn't work in the shallow water is to insult your intelligence. Furthermore, giant squids do not enter the southern portion of North Sea where the sperm whales beached themselves. Here's why: Scientists found a fourfold decrease in oxygen affinity of the squid hemocyanin with an increase in body temperature from 6.4ºC to 15ºC. Giant squids have a difficult time absorbing oxygen in the warmer shallow southern waters of the North Sea (link) even in January. They remain in the cold deep water of the North Atlantic and the Arctic Oceans. And, so do healthy sperm whales. As evidence, only one giant squid has ever been caught in the North Sea and it was already dead! It was netted in September 1982 by a trawler fishing on the northern portion of the North Sea, 100 miles NE. of Aberdeen, Scotland and 200 miles from the drop-off edge of the Atlantic Ocean. Although 115 giant squids have been recorded in the literature from the North East Atlantic between the years 1545 to 2004, this is the only one ever caught in the North Sea. Giant squids live and hunt at a depth of 500-800 meters, therefore, the finding of a dead Architeuthis in the shallow North Sea suggest that this animal's remains drifted into the area on cold bottom currents. The bottom line is simple: Sperm whales do not purposefully enter the North Sea because the larger squids they prefer to eat are NEVER found in this body of shallow water. These squids hang out along the deep mid-oceanic ridges of the North Atlantic, the Norwegian Sea, and the Arctic Ocean and along the deep continental drop offs. The cold hard facts yell out that something went wrong with their navigation system long before they even got near the North Sea. Said differently, sperm whales are the intelligent masters of the oceans. They know there is no food for them in the North Sea so they would never enter this body of water unless that had been injured in such a way to destroy their acoustic sense of direction. In other words, if you see a pod of sperm whales in the North Sea, you can bet that these animals are acoustically blind. And if they lost their biosonar due to an accident, they would also lose their acoustic ability to locate and capture the squid they feed on. This has been verified... Rob Deaville at the Institute of Zoology in London recently examined the dead whales (link). He said the whales had nothing in their stomachs but a few undigested squid beaks from some time long ago. He also noted that intestines of the stranded sperm whales were stained green from bile. The digestive tract of starving mammals is always empty with dark green bile staining the stomach walls. They had not eaten a meal in 2-3 weeks. There was nothing in their stomachs but indigestible squid beaks, green bile, and garbage that snatched up as the swim along the surface. This leaves only one conclusion: They had lost their biosonar system, could not dive and feed themselves, and could not distinguish between garbage and eatable items. To understand why whales mass beach you need to spend a few extra minutes reading and thinking about the facts listed below. (1) The cause of mass beachings must be an ancient one because this strange behavior has been ongoing for millions of years. (2) At least 90% of all mass strandings happened on sandy beaches. Why? (3) Strandings only occur on rocky shores when strong wind-driven currents are washing ashore. Why? (4) Whales do not strand during a flat calm sea. Why? (5) All species of toothed whales and dolphins that mass strand have one thing in common: they feed primarily on squids that are found along the undersea volcanic mountain range known as the Mid-Oceanic Ridge System and along the drop-off edge of continents. (6) Fifteen hundred (1500) moderate undersea earthquakes and volcanic explosions occur every year along the same ridge where pods of odontoceti dive to feed every day. (7) The rocky seabed jerks about during violent seafloor upheavals. This rapid up and down movement pushes and pulls at the water column generating powerful hydrostatic pressure disturbances above the epicenter. (8) These pulsating pressures are known as seaquakes. (9) The US Navy says, "seaquakes can kill marine life and sink ships." (10) The most common injury in human divers is sinus barotrauma caused by rapid and excessive changes in hydrostatic pressures. (11) If, while down on a feeding dive, a dangerous seaquake erupts below a pod of whales or dolphins without precursory warnings, the rapidly changing pressures will injure the membranes surrounding their cranial air sinuses and air sacs in agreement with Boyle's gas law. Keep in mind, the membranes of enclosed air pockets are the most vulnerable part of their anatomy when the external water pressure changes exceeding their ability to compensate. (12) Stranded whales and dolphins show no external injuries that can explain the beaching. (13) Pressure-related sinus injuries are not visible to casual observers. (14) Sinus injuries prevent diving due to severe pain. (15) A pod of seaquake-injured whales could not dive and feed themselves. (16) Whales and dolphins get all their fresh water from the fish and squid they eat. (17) The loss of the ability to dive and feed would be followed in a few weeks by severe dehydration and no fresh food in their stomachs. (18) All mass stranded whales and dolphins are dehydrated and their stomachs are devoid of fresh content indicating a diving accident ~3 weeks prior to beaching. (19) Mass stranding whales and dolphins navigate using the most-advanced echo-navigation system in the animal kingdom. (20) Their biosonar system would not function if they suffered a barotraumatic sinus membrane injury because the air inside their cranial air spaces serves underwater to reflect, channel, and focus returning echoes. (21) Enclosed cranial air also isolates their two cochleas from each other allowing odontoceti to hear stereoscopic-ally. (22) Biosonar requires ears that hear independent of each other. If they do not hear in stereo, their echo-navigation system does not function. (23) A pod of whales suffering sinus barotrauma would be as lost at sea as a blind man thrown overboard 40 miles offshore on the darkest storm-tossed night. (24) Because water is 800 times denser than air, lost whales cannot swim upstream without a visual reference point because the increased drag forces would simply turn their streamlined bodies around and point them downstream into the path of least drag without them even knowing it. (25) The downstream flow of the surface current would guide their swim path from the point of injury until they beached, or were eaten by vicious sharks. (26) The odds are extremely high that lost pods will be washed to a beach when the wind and/or tidal-driven currents are flowing towards the shore because the current that guides them is the same energy that carries each grain of sand to build and maintain the beach. (27) Beached whales will not swim out to sea when the water is flowing in towards the beach. (28) Beached whales will only swim away from the shore when the wind and/or tide-driven currents are flowing back out to sea. 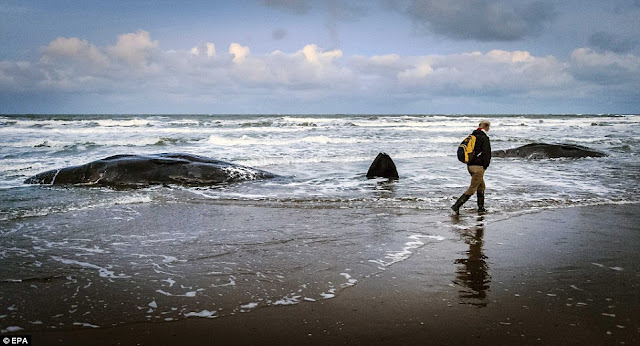 Here's how the dying sperms whales came ashore: On the 9th of January, two dead sperm whales washed up on the German island of Wangerooge on an incoming tide (link). On the 12th, five sperm whales, already in poor condition, were washed into the beach by horrendous wind-driven currents as they approached Texel Island (link). Then a few days later, as shown in the picture at the top of this page, two more sperm whales went ashore on the same island during the inflow of wind-driven currents coupled with the incoming tide (link). Then on the 20th of January, four sperm whales from the same pod approached the shore near Cliff Parade, Hunstanton inside the "Wash" on UK's East Coast at 52.937 N ; 0.481 E (link). This stranding site was 182 miles in a westerly direction from Texel Island. One sperm whale was pushed too close to the rocky shore by the incoming current and died. Next, on the 23rd of January, the 3 sperm whales spotted at Cliff Parade were found washed up on the beach at Skegness across on the other side of the "Wash." Eight more sperm whales were found on a remote mud flat on the German Coast (link) bringing the total to 23 whales. The total now stands at 30 dead sperm whales. Whale scientists, following the orders of the US Navy and the oil industry, are saying the whales entered the North Sea from the Arctic Ocean. This is highly unlikely because the currents were washing into the Arctic, not into the North Sea. The pod had to have entered the North Sea via the English Channel and the Dover Strait. This explains why they first beached near Texel Island. Here's what happened to destroy their navigation along with their ability to dive and feed themselves: On December 23rd, 2015, this all-male bachelor pod was diving and looking for giant squid a few hundred meters above the bottom along the seismically active Northern Mid-Atlantic Ridge at 45.11 N ; 28.09 W. Suddenly and without precursory warnings, an extremely shallow mag. 5 seaquake split the seafloor wide open. Many folks think a magnitude 5 quake is no big deal. Quakes of this size release the energy equivalent a little less than the atomic bomb that flattened Hiroshima. If such a quake occurred 100 km below the city of London, the energy would spread out from the foci in a wide circle and grow weaker and weaker with every kilometer it traveled in the vertical direction. The populous of London would only feel a little shaking. On the other hand, along a mid-ocean ridge system the average depth of the basaltic bottom between the rock-water interface and the molten lava is only ~7 kilometers. Many magnitude 5 earthquakes are focused less than 5 km below the interface with the water. In such cases, the energy does not have time to spread and weaken before it reaches the diving whales. Here's the really dangerous part for the whales. The average length of one complete cycle of a seismic p-wave traveling in warm basalt is about 6 km. If the focus of an earthquake is less than the length of one seismic p-wave cycle (less than 6 km), the energy travels from the focus straight into the water without deflection or refraction. It is as if there were no interface between the earthquake foci and the whales. Scientists call this an anomalous transparency. Although much of the work on this new finding has been done between water and air, the same transparency exists between basaltic rock and water. The problem right now for stranding researchers is that we can not find out if the depth of focus is less than the length of the p-wave because seismographic instruments cannot determine the foci depth from undersea quakes more than 1,000 km from the instrument itself. Instead, seismic stations default the depth of the hypocenter of shallow quakes along the mid-ocean ridges to 10 km. On the other hand, many moderate events are now being recorded 200 km offshore of Iceland no deeper than 5 km. On top of the above, there are more than 2 dozen variables to consider that are known only to our team. But we need very detailed maps of the seafloor to determine the danger from these variables. This means that whale scientists, without the benefit of our 50 years of experience, are no better than 5th graders at determining a whale-dangerous seaquake from one not so dangerous. They have no idea about the association whales have with underwater seismic activity. They are ignorant about seaquakes and have no business passing any judgment on whether or not these events injure pods of whales. The average person can get a better idea of what the whales might experience if they imagine a nuclear bomb a little smaller than "Little Boy" exploding 5-6 km below a pod of whales. This particular pod of diving sperm whales was caught by total surprise. The air in their cranial air spaces expanded rapidly on the negative pressures phases of the p-waves and compressed unmercifully during the positive pressure phases. These alternating pressure pulses crisscrossed their bodies on average ~14 times every second. A few of the membranes surrounding their cranial air sinuses ruptured and loose air leaked into their heads as these sinuses collapsed. We have no idea what other damage might have been done. Small bubbles (cavitation) would have formed in their warm blood. When these bubbles collapse violently on the positive pressure phase, the momentum of the collapse runs the pressure inside the bubble up to extreme levels. The sudden increase in pressure raises the temperature at the core of collapsing bubbles to extremes hotter than the surface of the sun. High-speed images confirm that bubble expansion can cause vessel distention, and bubble collapse can lead to vessel invagination. Liquid jets were also observed to form. This evidence suggests that all four mechanisms, vessel distention, invagination, heat, and liquid jets, can contribute to vessel rupture (link). Often the negative pressure phases during a seaquake will cause nitrogen to pop out of solution around the bony joints. Once these nitrogen bubbles form, cavitation sets in and causes tiny pits in the bones (link), which is evidence that whales have indeed survived prior earthquake exposure. But these survivals came at a time when surface waters were filled with large schools of small fish. This made it easy for the injured whales to ease down a few feet and catch a meal and stay hydrated and nourish. In time, they recovered. But not today because man has stripped the surface of the oceans of all the massive schools of small fish that seaquake-injured whales now need for recovery. This explains why evolution was not so concerned with seaquakes several hundred years ago. The pods recovered a few thousand miles downstream and established a new habitat. But those days are gone now so we are seeing far more pods strand than ever before. This is Mother Nature telling us to stop overfishing or prepare to say goodbye to all the whales in the oceans of the world. If it were not for the US Navy's Cover-up of the mystery of why whales beach, we would know the extent of the barotraumatic injuries and how we might help the poor whales. But these military bastards pay huge sums to crooked whale scientists to keep their mouths shut and the jackass scientists follow along like blind pigs. I say again: Because the air in the now busted sinuses at one time served to reflect, focus, and channel returning echo-navigation and echolocation clicks, the sinus injury knocks out their acoustic sense of direction and their ability to echolocate the squid. And, worst yet, they can no longer dive due to intense sinus pain. The earthquake has hopelessly rendered them lost at sea and unable to dive and feed themselves. That's also why they eat plastic and ropes and other garbage. The fear of being ripped apart by sharks causes the internally-injured sperm whales to huddled together and start swimming away. Whales fear sharks; that's why they live in pods. Each whale knows the odds that they will be the next whale torn to pieces is greatly reduced if they stay with their pod. If they leave alone, the sharks will surely single them out and tear them apart. The sharks also have a healthy respect for the whales so they don't rush in. They wait until a weak whale falls back from the safety of the group, and then they bunch up and attack. Which Way Will and Injured Pod Swim? This is the easy part. Because water is 800 times denser than air, the upstream current creates a strong resistance to swimming in every direction except downstream with the flow. Traveling with the flow is the same as swimming in the path of least drag. Since the whales have lost their acoustic sense of direction due to busted sinuses, they have no choice over which way they travel. They swim to get away from the sharks. At the same time, strong resistance (drag) to the flow of the current turns the lost whales and points them headfirst in the direction of the least drag. It can be no other way. If you have doubts about whether the pod goes downstream or not, please see navigation failure in mass stranded whales. These sperm whales huddle together in a tight group. The sharks, using the taste and smell of feces, blood, and urine, follow day and night from the rear of the pod waiting on a weak whale to fall behind. As shown by the chart below, the current from the epicenter guided the lost pod into the English Channel, through the Dover Strait, and into the North Sea. There were 3 seaquakes powerful enough and near enough to the stranding site. Two were in the Arctic Ocean north of the North Sea. These 2 events were disqualified because, as you can see in the chart below, the northern flow of the current would have guided lost whales into the Arctic and further away from the North Sea. And since the surface current was flowing out of the North Sea, this drew water in through the English Canal. The number of days between any suspicious seaquake and the stranding must agree with the distance traveled, the speed, and the elapsed time. Based on 40 years of coordinating seaquakes with mass strandings, the average downstream distance an injured pod will travel per day ranges between 100 and 125 miles depending on many factors. As the crow flies. the journey was 1633 miles from the epicenter to the first stranding beach. It took 20 days to make the passage indicating that the whales had time to swim in the twisting path of the current, traveling more than ~2,30o miles. They likely swam offshore past Texel Island. They were then separated by a rough sea into 3 different groups. This would explain why ten sperm whales washed up on the German island of Wangerooge on the 9th of January (link). Wangerooge is 150 miles beyond Texel Island. It would also explain why a group of 5-6 sperms went towards the UK coast. In other words, this pod consisted of 29 to 31 individuals broken up by a storm into 3 groups. The stomachs of these whales were empty (link) (link), which is in agreement with the loss of their biosonar system and their inability to dive and feed. And since their fresh water comes from the food they eat, they would have arrived at the beach in an extremely dehydrated condition. Dehydration causes its own set of problems, including distorted, foggy vision, mental deficits, and disruption of their balancing senses. I highly recommend: Why Whales Beach -- US Navy Cover-up ! This web page will show you why you are not aware of sinus barotrauma in beached toothed whales. It's a shocking true story. Deafwhale Society, the oldest whale conservation group in the world. Dec 06: why did the pilot whales beach in the Everglades? Copyright 1972 thru 2017: This material is the copyrighted intellectual creation of Capt. David W. Williams, and registered with the Writer's Guild of America—Reg. No: 10608118. The reproduction and use of any part or all of this intellectual creation in any form, including film, is strictly prohibited. In particular, no part of these web pages may be distributed or copied for any commercial purpose. No part of this intellectual property may be reproduced on or transmitted to or stored on any other website, or in any other form of electronic retrieval system or used in any film or book; however, you may link to this website without permission. Reference this web page as the source when quoting. Send email request for any other use.